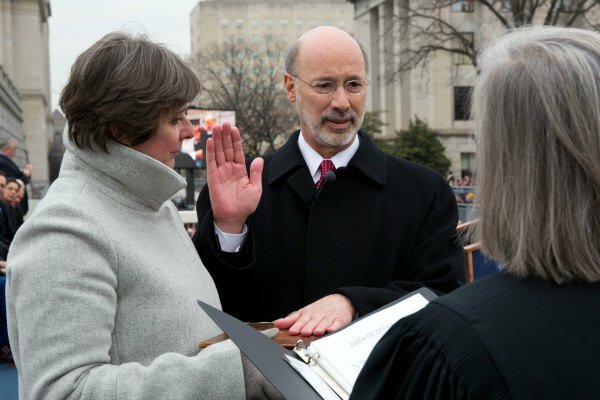 Pennsylvania Governor Tom Wolf, a Democrat, on Tuesday said that he would veto a bill that prohibits transgender people from using the bathroom of their choice. Appearing on NPR's Here & Now, Wolf, whose state was the biggest prize in Tuesday's presidential primaries, was asked to weigh in on such laws. “What about this issue that has come up, especially in some Southern states, these bathroom bills. What would you do if you got a bill like that about transgender people in the state of Pennsylvania not being allowed to use the bathroom of the gender that they identify with now?” host Jeremy Hobson asked. Recent laws in Mississippi and North Carolina have spurred companies, celebrities and politicians to call for repeal of the laws.